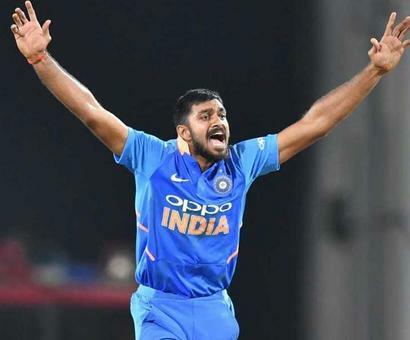 Virat Kohli's 40th ODI century and Vijay Shankar's fine all-round showing helped India down Australia by eight runs to take a 2-0 series lead, in Nagpur, on Tuesday. Shankar took two wickets in the final over to bowl out Australia for 242, after they required 11 for victory from six balls. He got the dangerous Marcus Stoinis leg before wicket for 52 before he bowled lastman Adam Zampa for two to lift India to a thrilling win. Shankar had earlier made a vital contribution with the bat, scoring a quickfire 46 from 41 balls. Captain Kohli top-scored with a magnificent 116, putting on 81 runs for the fourth wicket with Shankar to rally India after a few early wickets. But India failed to get going in the final few overs and were bowled out for 250 in 48.2 overs, with pacer Pat Cummins taking four for 29. Australia got off to a good start as Aaron Finch (37) and Usman Khawaja (38) put on 83 runs for the opening wicket. However, India bounced back in the middle overs as the spinners kept chipping away at the wickets. Peter Handscomb's run out for 48 by a direct hit from Ravindra Jadeja proved to be crucial as he in the company of Stoinis threatened to take Australia home. Bumrah's double strike, when he dismissed Nathan Coulter-Nile and Pat Cummins in the space of two deliveries kept India in the hunt. Earlier, captain Kohli hit a century but Cummins picked up four wickets to help Australia restrict India to 250. Kohli led the way with a fluent 116 to rally India after a few early wickets but Australia kept chipping away at the wickets in the middle overs to keep the hosts in check. Kohli put on 81 runs for the fourth wicket with Vijay Shankar, who made a quickfire 46 after being promoted to No. 5. But the Tamil Nadu all-rounder's unfortunate dismissal through run out at the non-striker's end after Adam Zampa deflected a straight drive from Kohli into the stumps, affected India's momentum. Zampa then left India in further strife with wickets off successive deliveries -- as Kedar Jadhav (11) and Mahendra Singh Dhoni (0) perished cheaply. India never really recovered from that double strike and despite Kohli hitting his 40th ODI century, he failed to get the required support from the other end. Ravindra Jadeja struggled to get the boundaries as he could only manage 21 off 40 balls and was soon removed by Cummins, while Kohli also fell to the same bowler. Kuldeep Yadav and Jasprit Bumrah also perished quickly as India could not even last their quota of 50 overs. Cummins registered wonderful figures of four for 29 in nine overs, while Zampa picked up two for 62. India's batsmen struggled in the last few overs. They were 204 for six in 40 overs, but managed just 46 runs while losing their last four wickets in 8.2 overs before they were bowled out.